Where to Partake in New York’s Glorious Ramp Bounty This SpringRamp pasta, ramp toast, ramp paratha. The Ramps Are Coming (on April 18)Mark your calendars says Greenmarket psychic-farmer Rick Bishop. Who Stole the Brooklyn Botanic Garden’s Lovingly Grown Ramps?It took Uli Lorimer the better part of a decade to cultivate his own ramps. It only took a few moments for them to be stolen. Greenmarket Ramps Are HereHype-backlash aside, this is a very welcome sign. 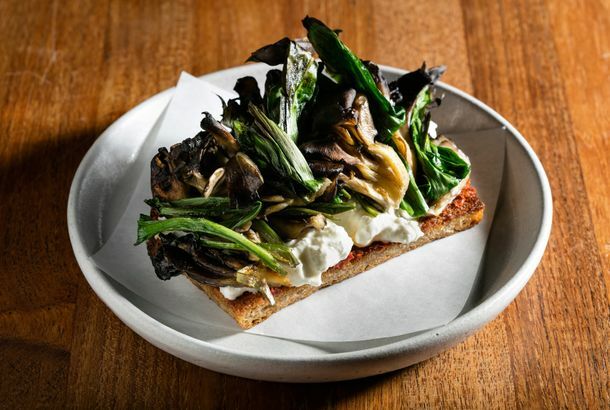 Rucola Celebrates Second Anniversary With Free RampsWhat are these ramp things everyone keeps talking about, anyhow? How Ramps Became Spring’s Most Popular, and Divisive, IngredientAaron Copeland and Ruth Reichl had something to do with it. Nathan Volz Ramps Up Spring at 10 ArtsAs sure as snow falls on the second day of spring, ramps are going on the menu tonight. It’s Happening: Spring’s First Fiddlehead Ferns Spotted in the WildThe cutest thing you’re likely going to find on the forest floor all week. Is Martha Stewart to Blame for the Scarcity of Ramps?Conservationists used to think foraging would die off with the old-timers, but Stewart had to go and make the movement all mainstream. Vedge Ramps Up the SeasonRich Landau is surprised by diners’ tastes. Here’s the First Ramps Sighting of the SeasonThe elusive wild Appalachian leeks are perhaps the most coveted, if not outright fetishized vegetable of the season. Rucola Owners Ramping Up Second RestaurantAnd it’s not called Arugula. Delaware Man Gets Jail Time For Exposing His ‘McNuggets’ at MickeyPlus: Is it safe to eat roadkill; and riots break out in Kenya and Uganda over rising food costs, all in our morning news roundup. Hot Spot Cafe Murder Suspect Nabbed in Seattle; Venice IHOP RobbedNerses Galstyan might be sent back to California while police search for two armed-robbers in Venice. Food Service Cuts Proposed for McCormick Place; Ramps Now May Be EndangeredPlus: Japan suspends beef exports, and Southern states looking for economic gain from the Asian carp. Papelbon Shills for Dunkies; Ramps on Watch ListPlus: outdoor adventures get cooking, and Japan suspends beef exports, all in our morning news roundup. Camden Bar Becomes Daycare Center; Ramps on Watch ListPlus: outdoor adventures get cooking, and Japan suspends beef imports, all in our morning news roundup. Menu Surfing: Prepping for Spring, Ko Lunch Still Seventeen Courses DeepPlus: a new reservation strategy. A Not-So-European Union of Soft-Shell Crabs and Pickled RampsWe’re coming into prime-time soft-shell-crab season, and we’re about to leave ramps behind us. So tonight’s special at European Union, sautéed soft-shell crabs with pickled ramps ($16), is something not to miss. The crabs coming up from Maryland are bigger and fatter than the ones seen earlier in the season, one reason chef Akhtar Nawab put the dish on the menu. Says Nawab, “The soft-shells are so nice right now, meaty, sweet, and really soft. They’re alive when we get them. The pickled ramps really cut the richness and tenderness of the crab with a nice garlicky and crunchy bite.” Nawab freely offers that he didn’t invent the idea of pairing ramps with crabs, but EU makes the dish their own by also adding pickled red onions, baby leeks, and (for a trace of sweetness) cipollini onions braised in red wine and honey. Be warned, though — even the meatiest soft-shell crab isn’t going to sate you. Be prepared to order a couple, and think twice about sharing them. In another couple of weeks the dish will be a memory. Lobsters Roll In, Fiddleheads Advance, and Ramps RetreatCool weather and rain have made for a slow growing season thus far, while also creating the ideal conditions for fiddlehead ferns, which sprout in damp, wooded areas and more than compensate for sun-bathing weather in our book. Ramps Signal Spring; Ripe and Runny Cheese Comes Early The pink, white, and green flag of spring has been raised: Little ramplets reared their heads a few inches from the damp earth last weekend, and Greenmarketers are already engulfed in the savory fumes of their oniony funk.